The Legends of 2013 and the Future of 2014! 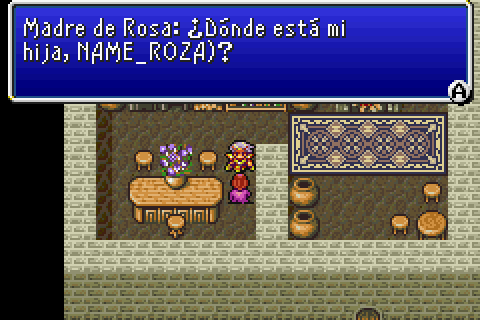 It’s almost the end of 2013, so I thought it’d be neat to take a look back and see how the Legends of Localization site has done! For fun, I decided to take a look at the site’s stats for 2013 – originally I wasn’t going to share this stuff, but for the sake of entertainment and future reference, here’s some of the more interesting data! I forgot what that giant spike was near the end of November, it turns out my article about the tourist lady in Pokemon X/Y hit the Reddit front page or some big sub-Reddit! I was mostly amazed that my site stayed functional; usually in the past Reddit would crash my other sites, even with caching plugins activated! I’m 100% honestly amazed at how many people visit the site on a regular basis – thanks for always coming and commenting and sending in your interesting questions! 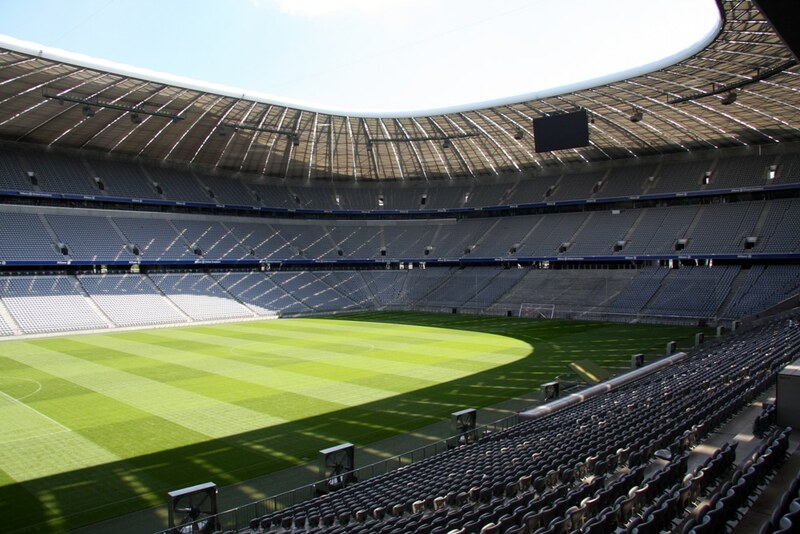 It’s also incredibly humbling to think that this dinky little site got enough unique visitors to fill a couple stadiums! 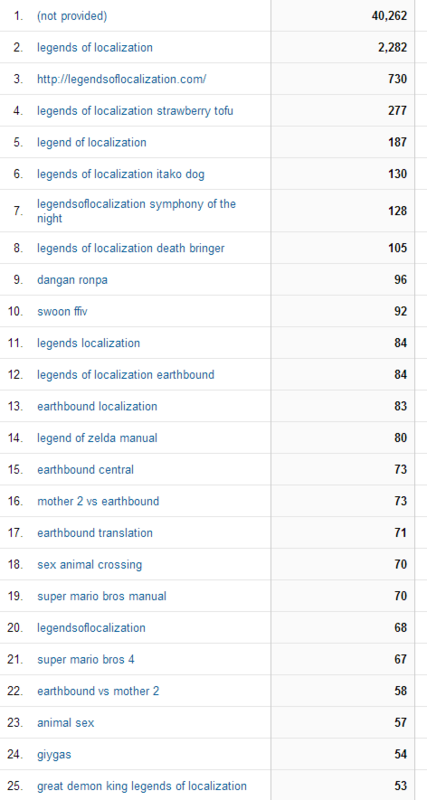 Holy Giygas I had no idea EarthBound dominated the site so much  I guess the fact that I run EarthBound Central plays a big part in that, but wow. It’s also interesting to see that Pokemon tourist lady post ranked so high! There are a couple eyebrow-raising entries in there, but I’m mostly surprised that so many folks were looking for Strawberry Tofu stuff on the site! I’m having a lot of fun with Legends of Localization, and here are a few things I’d like to accomplish in 2014! Continue to make small blog posts – these keep me from getting burned out on the bigger projects, and I enjoy finding answers to readers’ localization questions! Right now my update queue has about 100 questions in it, so already I got lots to write about A few weeks ago I had a Twitter poll for what I should do my next blog update about, and it went over pretty well. It’s got me wondering if I should do similar things more often, or if there’s some way to help prioritize some questions that readers most want to see answered. I’ll have to figure something out. 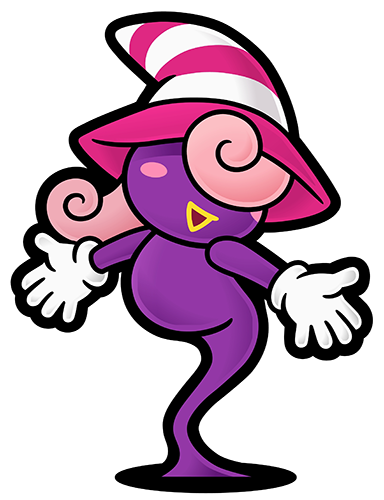 Finish my thorough article about Vivian in Paper Mario: The Thousand Year Door – I love this game and this is a common question I get, so I’m aiming for a really clear and informative article. MOTHER 3 is in a really weird place for me right now, so I don’t know about the MOTHER 3 notes just yet. I’m not going to drop them, though. Figure out how to speed up the comparison process to get a few more full comparison sections finished next year – right now I’m leaning toward something Zelda (a new-ish one probably) and/or Pokemon, but I’m planning to put up a poll later on. For now, if you have any suggestions, let me know in the comments or message on Twitter! 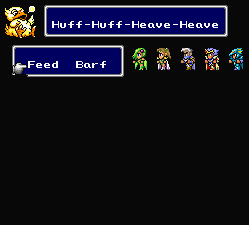 Maybe not in 2014, but someday I want to do a detailed look at some of my own early fan translations, as they’re full of funny bloopers and laughably amateur fan translator mistakes. It’s interesting, insightful stuff! Get a new site design for the front page and the blog stuff – what I have now is pretty blegh. But I’m not sure who to ask about this, as being a gamer who understands the site is a big prerequisite, and if I ask around I’ll just get a bunch of marketing guys bugging me. Create a section for really interesting external articles and videos – I’ve been meaning to do this for a long time but haven’t gotten around to it. There’s so much cool stuff here that I’ve never even touched on yet! Create dedicated pages for control code mistakes in official games, games with untranslated lines in them, and more. Readers have been sending me these, so I need to compile them eventually! Earlier this year I tried an experiment with progress meters and donations; I might try to improve that system to help keep things running smoothly and so I can focus more time on the site and update more! I’d like to at least publish one Legends of Localization book just to say I’ve done it. I think it’d be a neat experience, and it’d be fun to design! Continue to get in touch with industry veterans and legends, maybe even do interviews with some of them – maybe I could even ask them some reader-submitted stuff! I don’t know how yet, but I’d like to do some sort of videos. I think even just playing games side-by-side might be interesting, or at the very least they’ll be useful for reference. Videos take so much time that whatever I do will have to be something simple and light. Give some more inside looks at how localization works and how you can get into the industry for those who are interested – which seems to be a lot of people, actually! Similarly, for years I’ve wanted to come up with a small site or tiny page or book or something to help out a lot of the people who ask about how to start learning Japanese. If I can find the time, I’d like to finally make this happen! There are a number of other projects and mini-projects I’d like to get done for Legends of Localization, but I don’t want to make any promises or get any big hopes up yet. I think some readers might already have some ideas about some of them, though, so mum’s the word! This past year has been a blast for me, and I hope it has been for you too! Here’s to 2014 being even more legendary than 2013!